Do you want to see a grown man or woman cry, or at least whine like a toddler? Put cheap gloves on their hands and stick them out on the slopes during a storm or on a subzero day. Even a Navy Seal would have trouble keeping his complaints to himself when his hands were wet and numb. I have a high tolerance for pain (can you say natural childbirth?) but I cringe at the memory of frozen fingers… when they’re heading toward frost nip, followed by the bone-level pain as they thaw out. Point is—cold hands stink, no matter who you are. Thankfully, new technology and fabrics have boosted glove performance. Mitts have enjoyed an elevated status, thanks to athletes like Bode Miller, who made mittens cool after a hand injury caused him to loose feeling in some fingers. Companies have put a lot of money into research and design to keep our digits comfortable. Gloves such as the Arc’teryx Alpha SV glove combine an anatomically superior fit (like mini-sleeping bags for your fingers) with Gore-Tex, while the Canada Goose Down Mitten adds high-quality goose down for remarkable warmth. Whether snowboarding, backcountry skiing or riding the lifts, the following gloves and mittens will keep your hands warm and dry so you can enjoy your time on the slopes instead of whimpering inside. If you’ve ever tried to pick up a glass of water without using your fingers, you know how important dexterity is. Add having to hold on to ski poles, get on a lift, or unzip your jacket and you realize how much you use your digits during a ski day. The Phoenix II has an ultra slim fit and a goatskin palm for a proficient pole grip. It feels supple and flexible, thanks in part to the stretch nylon softshell exterior. Gore-Tex and Kombi’s proprietary lining wicks away moisture while goose down insulates. A waterproof pocket for a heat pack allows for extra warmth on über-cold days. 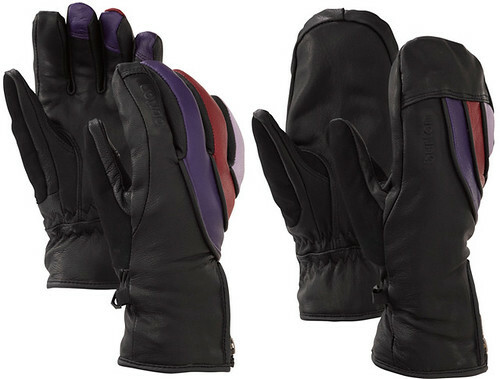 The Phoenix II is available in men’s and women’s sizes, in a glove or mitt style. The “back” in backcountry skiing means you won’t be "back" to your car for a while. OR understands this and has been making gear since its inception in the ‘80s by a mountaineer who wanted to make functional gear. His first mitts included idiot cords so they wouldn’t blow away in high winds. OR still makes gloves and mitts that keep you warm and dry as well as provide small features that make sense in the mountains. The Northback combines a waterproof/breathable Gore-Tex insert with water-resistant nylon across the back of the hand. 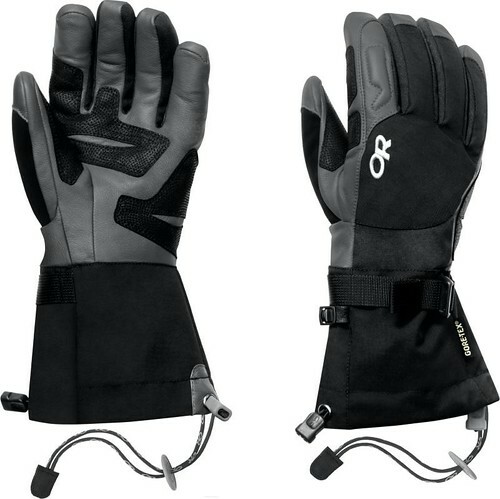 EnduraLoft insulation adds warmth, and stretch-woven fabric and a leather palm around fingers add dexterity. And of course those idiot cords are still there, but they are removable in the new millennium. It’s a given that snowboarders feel the snow more than skiers. That’s why “warm” and “waterproof” are top priorities for snowboard gloves or mitts. But technology has created another priority: How do you control your music or touchscreen without getting cold digits? Enter the Veda, worm by Burton women’s team members Kelly Clark and Hannah Teter. Sure it has a Gore-Tex waterproof/breathable insert and 3M Thinsulate insulation. But the coolest feature? The new TouchTec Leather Palm feels like leather but features nanotechnology that allows your gloved fingers to operate touchscreen devices. Enjoy rocking out to music in the halfpipe? 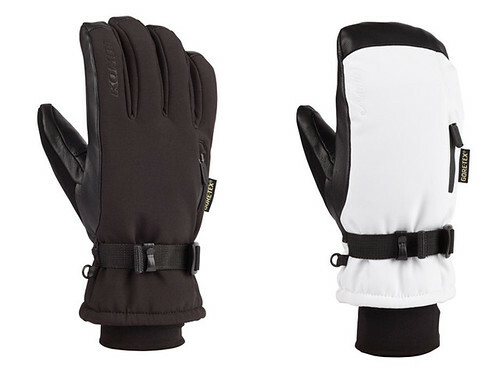 Try the Mix Master Glove or Mitt ($159), which features a wireless remote control for iPods or iPhones located on the back of the hand. The Touchscreen Liner (under $20) comes with a membrane on the index finger and thumb to allow you to operate your phone or music player without exposing your skin to the cold, wind and snow.